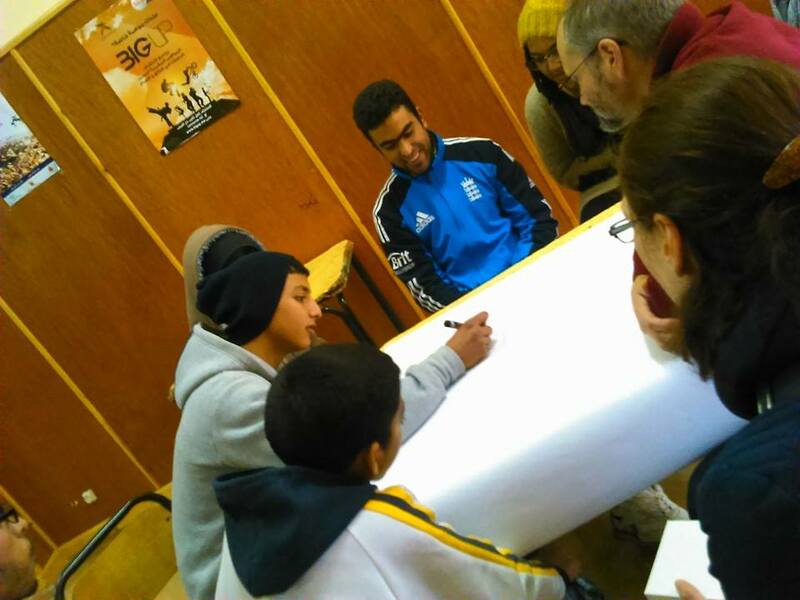 I thought I should give an update on what our CBT group has been doing at the local youth center—known in Morocco as a Dar (house) Chebab (youth). Depending on the town or city one is in, a Dar Chebab can be either large or small, and the level of structured programs can vary from highly organized to quite informal. The Dar Chebab in our town is a larger building, but it is not utilized these days as much as it has been in the past. Our CBT group was asked by the Mudira (director) of the Dar Chebab to start leading some activities that might draw youth to attend the center more regularly. I should note that people well into their 20s can attend Dar Chebabs, so it’s not uncommon for university students and post-graduates to attend a Dar Chebab, generally to take English language classes. One of the challenges many younger Moroccans face is the lack of professional work opportunities, even if they have completed Masters or PhD-level courses of study. I am discovering that young people in Morocco are both very smart and highly motivated to gain skills that can help them find gainful employment. 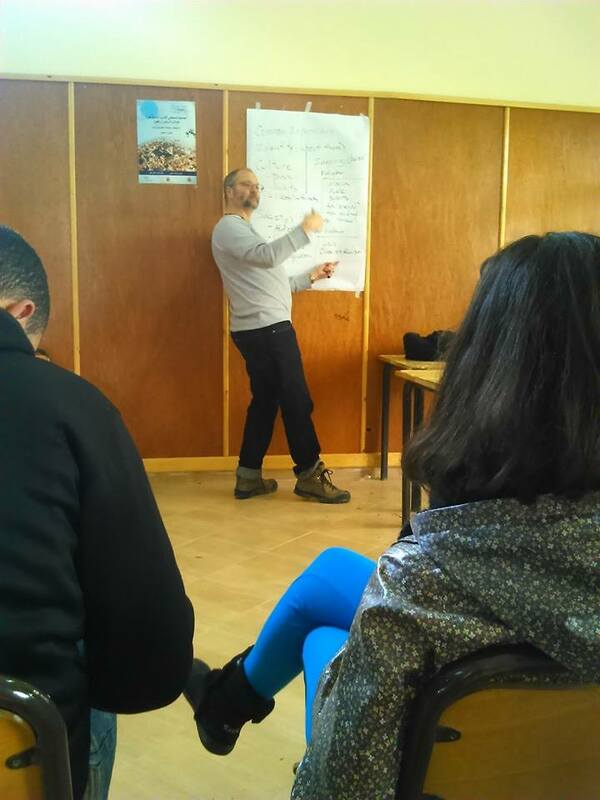 I should also note that many young people in Morocco speak basic French and English in addition to Darija and classical Arabic. Community Mapping Project at the Dar Chebab. Last week we began conducting group activities, starting with a Peace Corps community development tool called Community Mapping. We had a group of six males for this first session, ages 12-22. The intent of Community Mapping is to learn about our community from the perspective of what the young people think is most important to know. It is a nice way to visually capture the places in our town that they enjoy. At the end of the session we asked the group what activities they would like to do with us in the coming weeks, and learning English (or refining their English ability) was definitely the biggest interest. We told the group to please invite others to come to future sessions. Thomas leading a discussion about what the youth want to learn from us. The following day we had 12 kids show up for our session (we doubled our attendance in one day—hooray!). The age range of the kids on the second day was 12 to 24. The group included several young men who were completing advance degrees in chemistry, political science and physics. In order to learn more about the people in the group we broke into small groups to practice personal introductions. The rest of the session was spent generating a list of the topics and issues that the group hoped to discuss over the coming weeks. The energy of the session was quite positive, and when we asked the group whether the session had been helpful they said yes. Again we encouraged them to bring others to the next day’s session—including some young women. No girls had attended as of yet, so we asked the young men to consider inviting female relatives or friends to attend. Day three’s attendance was 16 kids, including one girl! We were getting to know some of our regular attendees better, and also starting to recognize some of the informal leaders among the youth. Those who had now come three times also seemed increasingly comfortable with us. 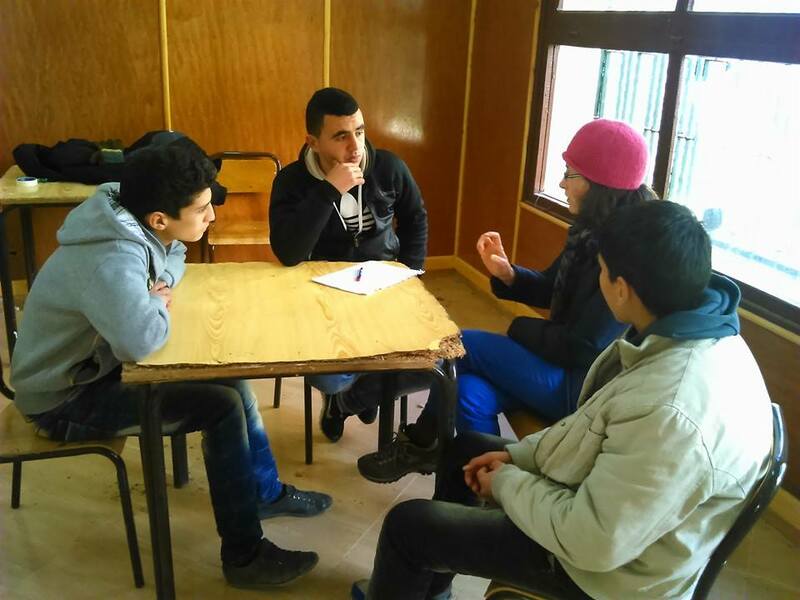 The third day’s focus was interviewing skills. We broke into groups of four and practiced how to learn about one another in English. After this we all returned to the larger group and introduced each other. Getting to know the attendees–these fellows were all very good English speakers and wanted to discuss philosophy. Our attendance at the final session of the week was 22 youth—almost four times as many people as we had on day one! Clearly word-of-mouth works well in Morocco. We started the session with some English vocabulary games, and then practiced story telling in English in small groups. The three boys (ages 16-19) in my group were close friends who are also in a rap group called “Kala Boys”. They told me about how they started their group, and what Moroccan and American rap artists they enjoy listening to. They even performed some of their rap music for me! And while some of their lyrics were peppered with English profanity, I could tell they were very sweet kids. I like to think their style is similar to the early work of the Beastie Boys. Check out their video to see if you agree. So there’s an overview of our early efforts with the young folks in town. Our next session at the Dar Chebab is scheduled for February 16th. I am optimistic that attendance at the sessions will continue to grow, and will give updates over the coming weeks on our experience with the youth in our community. Thank you for sharing with us about your experience! It reminds me of the days I spent in my Dar Chebab!